As you may know, Los Angeles is the second biggest city in the United States. As such, there are many different activities available, to the point where any tourist or resident will never run out of sites to see and things to do. One great way to experience as much as you can of what this exciting city has to offer, is to travel to different sites on a party bus. If you have several people with you, you can both enjoy your time on the party bus and travel to multiple destinations in one trip. If you and your crew are a fan of shopping, you should definitely take that party bus over to Rodeo Drive. You may or may not be able to afford the things that are there because most of the stores are high-end boutiques with a lot of designer labels. However, even mere window shopping in this great atmosphere can be a lot of fun. You can see items designed by Valentino, Burberry, and Roberto Cavalli, among many, many others. The Beverly Hills Hotel is also in this location. If you are fans of movies, you will definitely want to make a stop at the Hollywood Walk of Fame. Almost 2,500 celebrities’ names are written in gold on pink terrazzo embedded into the ground. You may enjoy seeing the names of your favorite celebrities here in person. You may even want to plan to see a star ceremony, if you are there at the right time. If you enjoy music, one great option is to see a concert at the Walt Disney Concert Hall. There are many different types of concerts offered throughout the course of the year. If you like orchestra concerts, you can choose a night when the Los Angeles Philharmonic will be playing. Disneyland is another highly recommended stop that you make, although you will probably want to spend a day here. Whether you have children with you or the bus is full of adults, you can enjoy a walk down Main Street USA to experience a wide variety of atmospheres. You can also spend some time with your favorite Disney characters. There is an almost endless variety of rides, tours, and other activities that you can enjoy. There is even a Bakery Tour, hosted by Boudin Bakery. 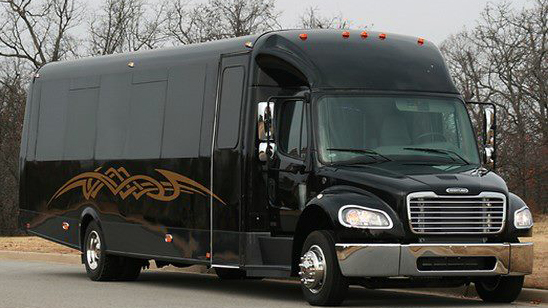 At night, you can take the party bus to a variety of different places, depending on your tastes. If you enjoy comedy clubs, you can trek over to the Upright Citizens Brigade Theatre, which features multiple shows per night. There are different comedic performances that you can enjoy, including various improv, standup, and sketch shows. There will be performances by famous comedians, as well as possibly equally entertaining performances by amateurs. If you enjoy clubbing, and everyone on your bus is of age, you can also go over to Avalon, the premiere nightclub in the city. Here, you can see a concert, or even have a private party with your entire group. There are different events scheduled almost every night here. If you would consider yourselves more hipsters than conventional partygoers, you may prefer to visit The Smell. There are many different nightclubs in Los Angeles that you can try out, but these are two of the most popular. Although the options in Los Angeles are virtually endless, the above include just a few of the best places you can visit in the city in a party bus. Next time you are in Los Angeles, you should definitely give both the party bus and these sites a try. Depending on how long you are able to keep the party bus, you may or may not even be able to visit all of these sites. Regardless of which ones you visit, you will almost certainly find the experience to be well worth it.